Last week, the Cook County Treasurer’s Office mailed out the 2012 second installment property tax bills to all Cook County Homeowners. 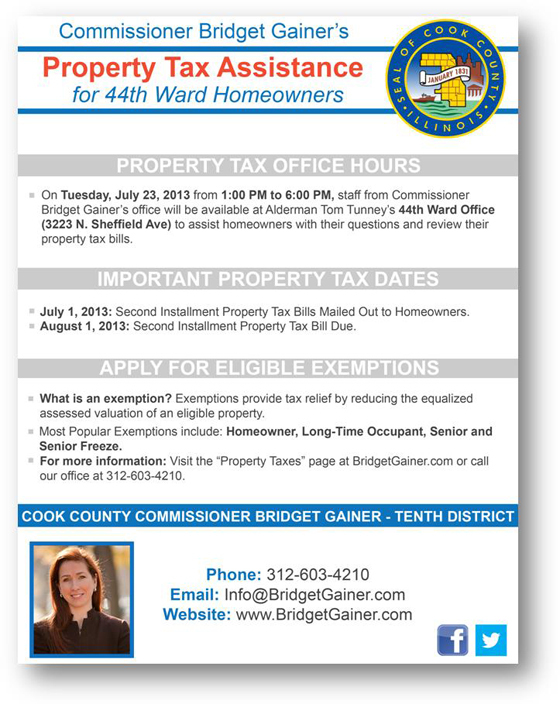 On Tuesday, July 23 from 1:00 PM to 6:00 PM, staff from Cook County Commissioner Bridget Gainer’s office will be available at Alderman Tom Tunney’s 44th Ward office (3223 N Sheffield Ave.) to offer onsite property tax assistance. Homeowners can visit Commissioner Gainer’s staff to ensure all eligible exemptions are being applied and to answer any questions. This entry was posted in Community News, Ward 44 and tagged 44th ward, Alderman Tunney, Commissioner Bridget Gainer, Cook County on July 10, 2013 by elvn_updates.